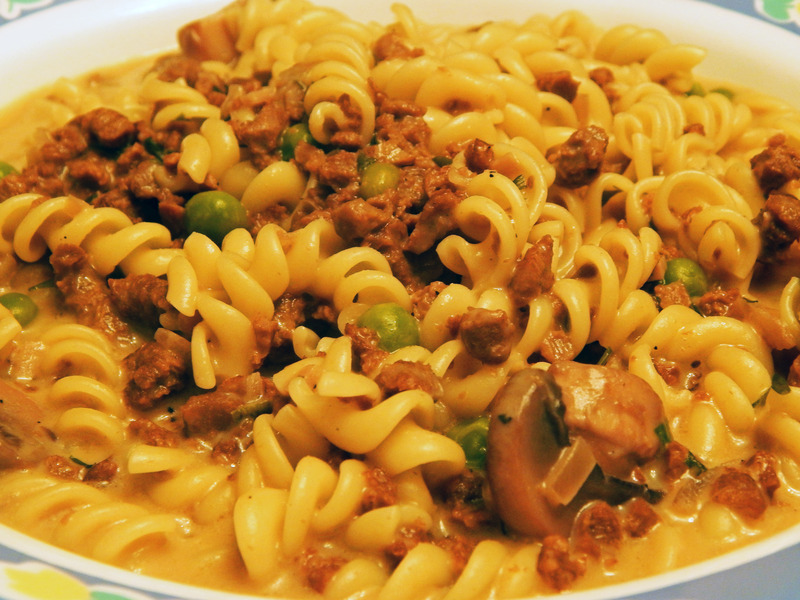 With its rich sour cream sauce, marinated beef and mushrooms, and hearty egg noodles, it’s classic omnivore comfort food, perfect for winter or these final chilly, damp nights of spring. But like my mother’s spaghetti with meat sauce, beef stroganoff has proved another dish difficult to veganize. 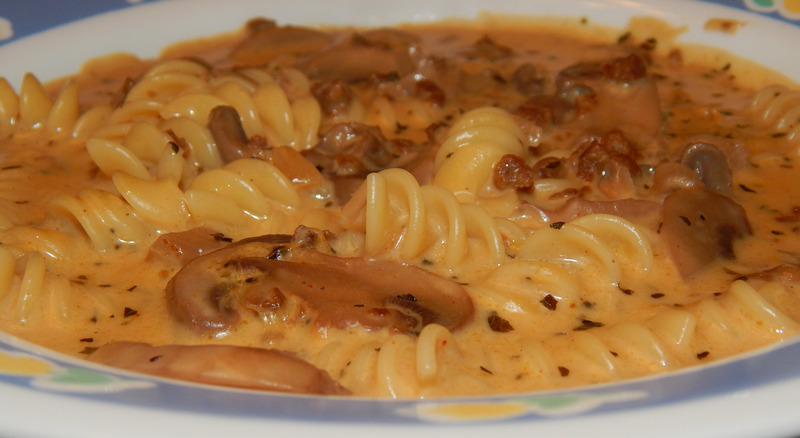 Leaving out the “meat” entirely doesn’t work – the cream sauce is rich and using just mushrooms, even portabello mushrooms, makes it too heavy. Using soy crumbles sorta kinda works, but if they simmer in the sauce too long, they succumb to the sauce and become soggy. 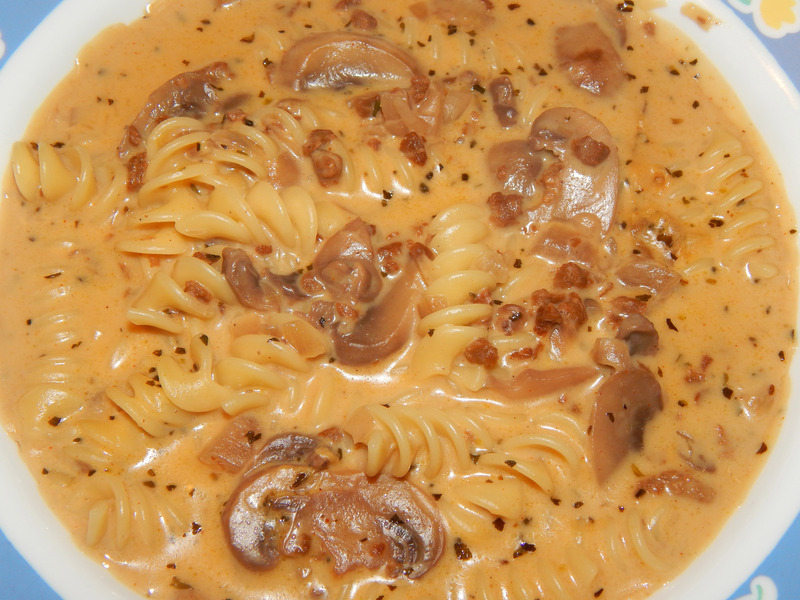 Which is why, when I got around to testing my final Upton’s Natural product, I thought of Beef Stroganoff. Upton’s Italian Seitan crumbles were chewier than regular soy crumbles and held up well after simmering for awhile in pasta sauce. Perhaps their regular seitan crumbles would do the same? I’m pleased to report, the experiment was a success! Start heating the water for your pasta in a large pot. Brown the Upton’s Naturals Seitan Crumbles in about a tablespoon of vegetable oil in a large saucepan. Once browned, remove crumbles to a bowl and set aside. In the same saucepan, add the remaining tablespoon of vegetable oil. Add onions and saute for 3-4 minutes. Add garlic and saute for another 2-3 minutes. 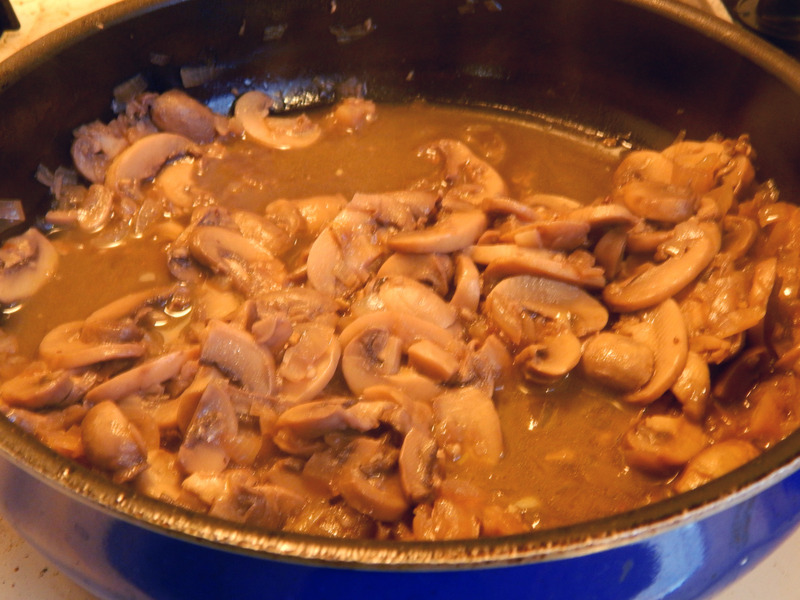 Add the sliced mushrooms, saute for a few minutes, then add the wine and bring to a simmer. 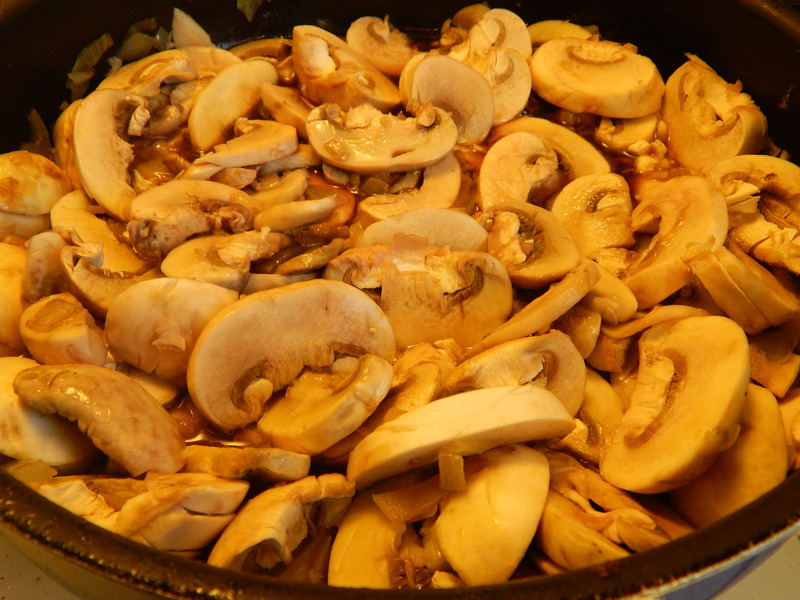 Let simmer for 5-10 minutes, stirring occasionally, until the mushrooms have released all their juices and “shrunk.” This step is important, as the mushroom “juice” provides major flavor to the sauce. This is what your mushrooms should look like when you begin cooking them. This is what your mushrooms should look like when they are ready. This is what I mean by mushrooms “shrinking” and releasing their liquid. At about this time, add the pasta to the boiling water and boil according to the directions on the package – usually about 10 minutes. Be sure to check on the pasta – you want it slightly al dente (“firm to the tooth”) as it will become slightly softer after it is mixed into the cream sauce. 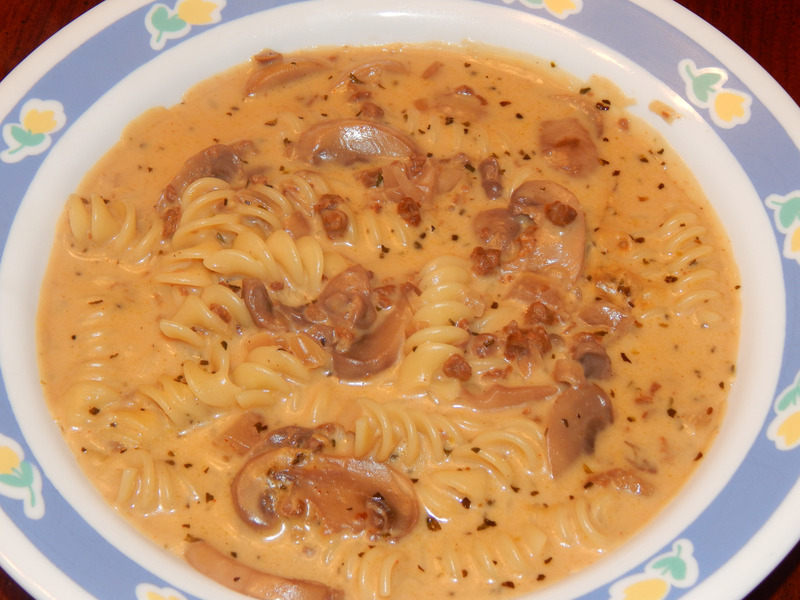 Once the pasta is done, add it to the sour cream/mushroom sauce. Stir. Serve immediately. The sauce will thicken upon standing, so if it gets too thick add a little more vegetable broth. Be aware that leftovers (if you have leftovers!) will get verry thick! Don’t panic. Just heat the pasta up and the warmth will make it liquidify again. If it’s still too thick, add a bit more broth, or a little water with a dash of soy sauce or Braggs. Peas: Peas are not traditionally added to Beef Stroganoff, but I thought they would be a nice touch and turns out, it was! Noodle Note One: I used rigatoni noodles because they mimic they curves of egg noodles, and the curves in the noodles help scoop up sauce. Bowties might also work. Avoid long, skinny noodles like spaghetti or linguine. Noodle Note Two: Add the noodles of your choice into the sauce, a little at a time. The same amount of dry noodles can boil up to different amounts when cooked. 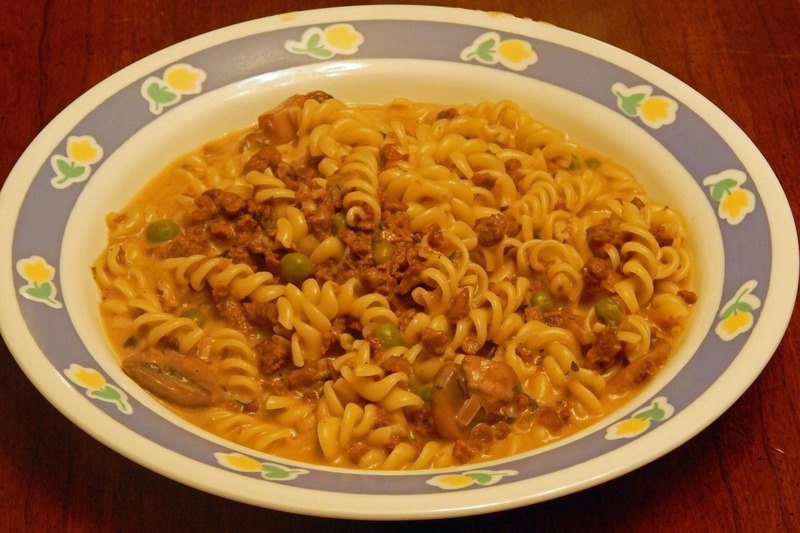 By adding them into the sauce a little at a time, you can control how “dry” or “saucy” the noodles become. Without peas, and a little more sauce! Customize the recipe to fit your taste! « If You’re Vegan, Don’t Eat At Tupelo, Honey! Looks delicious! Will definitely try it 🙂 not sure what the Crumbles are though? Thanks for stopping by, CTVeganista! I used Upton’s Naturals Crumbles (seitan). I believe it’s a fairly new brand. You could also use soy crumbles in the recipe (such as Boca), just throw them in the sauce at the very end as they get a bit “soggy”. Loving the pictures… I’ll have to give this a try with soy crumbles! Oh, Soy Crumbles will work as well … just don’t simmer them so long!